Sage HRMS offers many benefits to the average small to mid-sized business. Just think about the time spent on human resources needs now. How many hours a week do you spend processing payroll, answering questions about benefits, updating employee job description, and other HR tasks? With the right HR software, you can greatly shrink the time spent on HR. Only about 32 percent of businesses use HR software. The rest still use paper-based files, pen, and paper to manage the considerable documentation needed for employee onboarding and management. And, although HR may seem like one department where the “human touch” is still a requirement, companies using HR software find that it saves time, enhances their ability to manage personnel, and frees up valuable time among HR employees for other tasks. Human resources automation doesn’t necessarily mean you have to lose that human touch. Think about other areas of your company where automation has been put into place. Sales, marketing, accounting, finance, and production have all benefited from automation software. Why not human resources? Just because you are managing people, rather than products, doesn’t mean accountability and productivity aren’t important. The right HR software can make a big difference to your company. Online business systems and business process automation increase efficiency, reduce costs, and improve information within a company. Document management: From importing human resources documents into a single, central repository for managing documents, HR automation software is great for managing all the paperwork found in today’s HR departments. File storage: In addition to storing documents, HR software can store files so they can be shared on multiple devices. Record archiving: Instead of placing file folders into cardboard boxes and storing them off site, store them electronically by archiving records. HR audits: Audit compliance with HR policies and laws through your software to save time and effort. Sage HRMS also enables you to collect human resources data. As with any business data, HR data can be used to make better decisions. Consider automating the recruiting process. For small businesses, planning or handling recruitment without HRMS in place can increase the spending for recruitment efforts. It’s pretty much impossible to keep up with all the resumes that an HR department receives. Automating this process can check for specific keywords and sort through resumes to find the best candidate. It can also help in tracking and monitoring applicants, create job requisitions, and post them out to job boards and social media platforms. 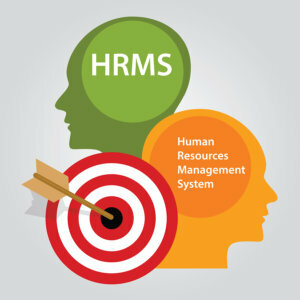 Performance reviews and performance management are another area greatly improved by using an HRMS system. Both take up considerable time in the work year. With Sage HRMS, you can automate the entire performance documentation effort and use the face-to-face time to discuss goals, objectives, and plans for improvement. Cloud-based HRMS enables you to add the system immediately without costly investment into hardware. As with other cloud software, all you need is an internet connection and you’re set. Investing in the benefits of HRMS is a great gesture to your employee base that you are taking their employment seriously and are committed to meeting your obligations as an employer. Additionally, it helps with employee engagement. When your employees see the business cares about them, they, in turn, are more likely to care about the business. Ready to Add Sage HRMS? How do you know when the time is right to look for HR automation? When the error rate within your HR department rises to an unsustainable level or creeps over a threshold you’re comfortable with accepting. Another sign that the time is right to add HRMS to your software suite is when manual reports are taking up too much time. Employees who spend time working on spreadsheets aren’t spending time on the tasks that make a big difference to the organization. With Sage HRMS, you can deliver reports on all HR functions including payroll, attendance, and more with just the touch of a mouse. If you’re ready to learn more about Sage HRMS, contact us. Adding human resources automation may make a big difference to your organization’s efficiency.